Sometimes a bacterial, viral or fungal infection can affect the heart. 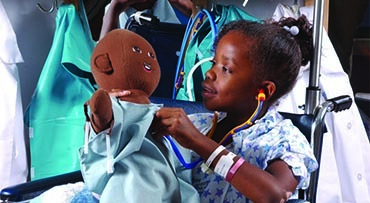 While most heart infections in children are temporary and heal on their own without treatment, it's always important to have an infection evaluated by a medical professional. 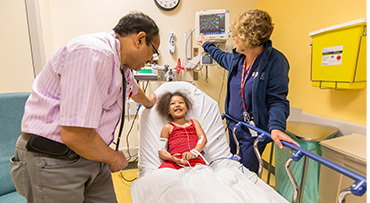 Cardiologists at the University of Chicago Medicine Comer Children's Hospital have expertise in diagnosing and managing a wide range of infectious heart conditions, including endocarditis, myocarditis and pericarditis. Endocarditis is an infection in the inner lining of the heart (endocardium). It occurs when bacteria from the mouth, or elsewhere in the body, enters the bloodstream and attaches to the heart. Fungal infections or certain medical conditions, such as some autoimmune inflammatory diseases, may also cause endocarditis. Children with congenital heart disease, including valve disorders, have a greater risk for developing endocarditis. 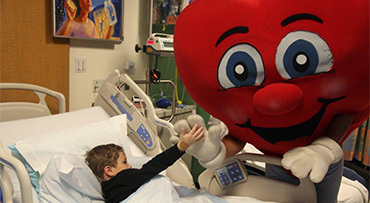 This infection is not common in kids with healthy hearts. If a bacterial infection is the underlying cause, the endocarditis will likely go away with antibiotic treatment. In severe cases, where endocarditis has caused heart damage, valve repair or replacement may be necessary. Myocarditis is inflammation of the middle layer of the heart wall (myocardium). It may be caused by a viral infection or, less likely, a bacterial or fungal infection. Allergic reaction to medication is another possible cause of myocarditis. Myocarditis often improves without treatment. In some cases, it may be necessary to treat the underlying infection. For example, in cases where myocarditis is caused by bacteria, a cardiologist may recommend antibiotics. Pericarditis occurs when the thin, sac-like membrane around the heart (pericardium) becomes inflamed, causing a build up of fluid between its inner and outer layers. Most cases of pericarditis in children result from a viral infection. Cardiac surgery, trauma and some autoimmune inflammatory diseases may also cause irritation in the pericardium. Children with pericarditis usually experience chest pain. They may also display symptoms related to the underlying cause of the infection, such as fever and/or fatigue. Pericarditis often improves without treatment. In some cases, it may be necessary to treat the underlying infection with prescription medication. More severe cases of pericarditis may require interventional or surgical treatment.